DECWARE - Audio Paper - Where's the fuse? 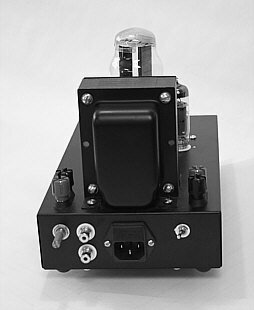 With the exception of the first couple hundred amps we've sold, our tube gear is manufactured using a standardized IEC connector to facilitate removable power cords. You can see the IEC connector pictured on the left. The power cord has been removed. What may not be so obvious is that this IEC connector also hosts a fuse holder to protect the product. It is a super high quality IEC that costs over three times the standard "made in china" clones. 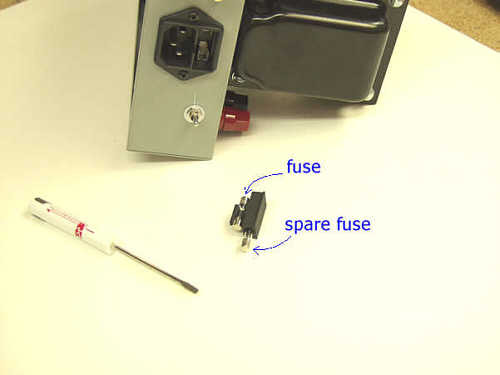 Below are a couple pictures that illustrate how to remove and or change the fuse. 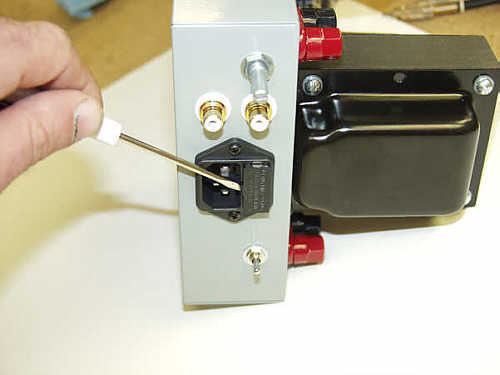 All of our products come with a spare fuse also located inside the IEC connector. Pry the tab open as shown in the picture above. This will release the fuse holder. In the picture above you can see the fuse is held in place by fuse holder. Since the holder is partially hollow, it also contains a spare fuse. Once you have replaced or inspected a fuse, the holder can be re-installed into the IEC connector by simply pushing it back in.